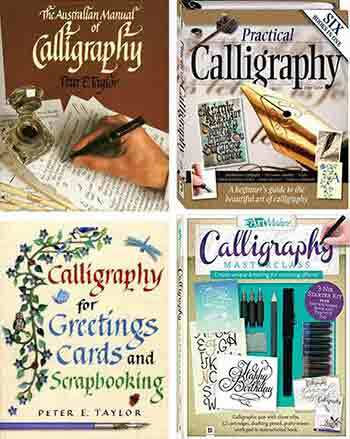 Elegant & artistic calligraphy for every occasion by the author of Practical Calligraphy & other books. Tuition also given in formal and modern styles. 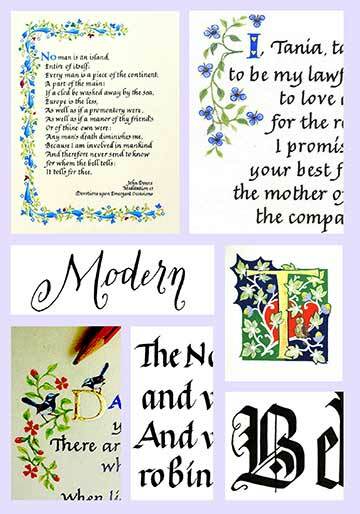 Welcome to Peter Taylor’s Calligraphics, established in Brisbane, Australia, in 1987 and catering for the professional calligraphy needs of clients worldwide. For over 30 years, Peter has worked for private, corporate and government clients, elegantly and artistically calligraphing poems, wedding vows, love letters, certificates, invitations, place cards, writing names in books, good wishes on greetings cards, and creating gifts and presentations. 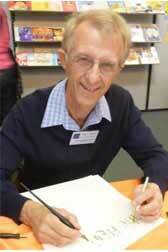 His calligraphy books have been published by Allen and Unwin, HarperCollins UK, Hinkler Books and GMC Publcations UK. Peter will be delighted to create special works of art for you, or teach you how to write in calligraphy and, if you wish, illuminate it using 23ct gold leaf! Please browse this website for ideas …but if you already know what you would like, Peter will be delighted to bring it to reality! Please email or phone to discuss your requirements. Peter is noted for writing in and teaching a wide variety of calligraphy styles, and he uses paint and gold leaf to create exquisite decorative capitals and borders. Scripts can be formal and based on historic examples or free-form ‘modern calligraphy’. Please Note: Peter writes with water based archival and fade-proof black ink using dip-nibs or fountain pens – preferably on smooth paper or card. When coloured writing is required, he uses the finest artists’ quality watercolour and opaque gouache paint for maximum fade resistance. He can usually supply the paper for poems and longer works. Occasionally, works are written or illuminated on vellum made from calf skin, as was used for medieval books. Peter enjoys providing tuition, passing on all his knowledge through classes, workshops and summer schools, and to individuals in one-to-one sessions from his studio. He also designs and develops artists’ books which are useful when poems are very long, and can teach the skills required. One of Peter’s handmade books written in calligraphy and illuminated with gold leaf (and covered with his own handmade paper) was commissioned by World Expo 88 as part of its gift to the Queen at the opening. His artworks have been exhibited in the Queensland Museum and the Queensland State Library, Queensland House in London and galleries around the world. Commissions include the ‘Aboriginal and Torres Strait Islander Recognition Statement’ for the government, a presentation to His Holiness the Pope and artworks for boardrooms and bedrooms. Peter is a former school teacher and now Registered Blue Card holder, providing tuition to adults and children individually or in groups; school visits or residencies, and to teachers for in-service professional development training. Subjects include: Calligraphy and Illumination; Border Design; Artist’s Book Construction; Creativity with Paper; Papermaking; Bookbinding; Illustration; Writing Picture Books; Visual Literacy; Book Cover Design.